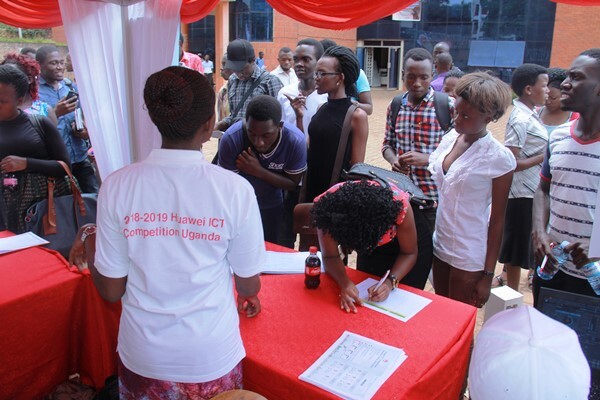 800 I.T students from Universities all over Uganda have registered to take part in the global Huawei ICT competition in the first round of registration that happened between 17th and 18th September 2018 at Makerere, Kyambogo, Muni, MUST, Lira, Gulu and Busitema University respectively. With the theme “Connection, Glory, Future”, the Huawei 2018-2019 Global ICT competition aims to provide a platform for global ICT talents to compete and communicate, promote high-quality ICT talent development, and drive the growth of a robust and sustainable ICT talent ecosystem. The registered students are expected to access learning material in the various courses and certification portfolio provided by Huawei free of charge such as Routing and Switch, Data Centres, Cloud computing, Network and transmission among others. They shall also access simulation tools, online mock tests and written examinations for the top 100, of which three will be selected to represent Uganda in the regional finals in South Africa in December 2018 and in the global final in China in April 2019. Mr. Liujiawei, the Managing Director of Huawei Uganda noted that through this competition, the students will be able to connect to industry learning technologies to prepare for their careers early enough, access to various learning tools and resources from Huawei and also the Ugandan students would be able to compete with other various other countries in Africa and the world if they manage to pass the preliminary stages. “This is not only a competition, but also a platform for Ugandan I.T students to obtain professional acknowledgment from the ICT industry through the Huawei Certification. When the students pass their examination in the competition, they shall also receive Huawei Certification. They shall also receive other awards from Huawei such as Mate Book device, mobile phones, trophies, job and internship offers. Our target is that we over 1000 Ugandan students register to participate in this competition this year”, He added. Speaking at the Roadshow at Makerere University on 17th September, Kidega Moses a 4th year student of Software engineering and the President of ICT at Makerere University commended Huawei for the great free opportunity given to the students to learn and to compete favourably with other students around the globe. He adds that “we are very excited about this as students. Huawei has done something that has never happened before at Makerere University and thought outside the box to reach out to the young innovators who have the solutions and ideas for this world”. The previous edition of Huawei Global ICT Competition in 2016 to 2017, attracted 40,000 applicants from 800 universities in 32 countries globally while the 2018 to 2019 version is expected to attract 50,000 contestants in 50 countries during the preliminary stage. With registration still going on until 30th September 2018 through http://bit.ly/huaweicompetition2018, Huawei targets to reach both Public and Private Institutions with I.T related courses to have their students enroll for this competition.